This computer was also known as the Kienzle CC-9010, sold by Kienzle Computer GmBh. (Germany). The PSI-80 can be used in a multi-user (up to 16 terminals) configuration through Kobus, a coaxial network developped by Kontron. 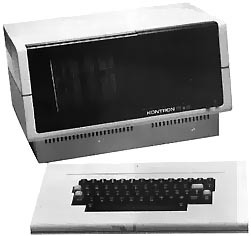 Several models were launched (with 32kb, 64kb or 128kb RAM). Microsoft BASIC is given with the 64kb and 128kb models. This BASIC interprets the statements as they're typed, so lines with syntax errors couldn't be entered. The upper 64kb (on the 128kb model) are used as a RAMDISK. The PSI80 runs under KOS (the operating system designed by Kontron). This operating system isn't fully CP/M compatible. However, a small emulation program allows the use of CP/M programs on the Kontron. There was a Black & White video out port on the rear, so an external monitor could be connected. see more Kontron PSI 80 Ebay auctions !